Raspberries are a pretty easy crop to grow in my opinion. Last year I transplanted a whole bunch of raspberry canes from my parents’ garden to ours. The canes have grown and spread like crazy. This year, the object of the game is to contain the canes–a little bit. 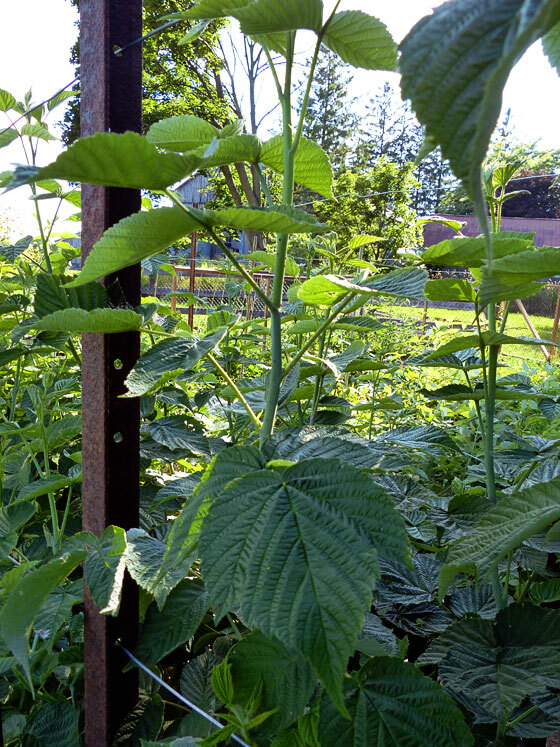 Raspberry canes don’t bear fruit until their second year, so the first year is all about letting the canes grow… and grow… and grow. The taller the canes grow, the more likely they are to fall over. A trellis can help to keep them upright and also keep the row a manageable width. Here’s how Matt and I made the trellis for our berries. We started with metal T-posts. We happened to have a large quantity courtesy of past owners–free materials, yay! And I liked that the metal won’t rot like wood. The posts were about 7 feet long. Matt hammered them into the ground leaving about 5 feet sticking up. We used six posts, three on each side, for our rows, which are about 18 feet long. The width of the rows is 2 feet. Then I strung wire through the holes on the T-posts. There are three rows of wires, each about 16 inches apart. At the final corner I doubled the wires back and twisted them around themselves. 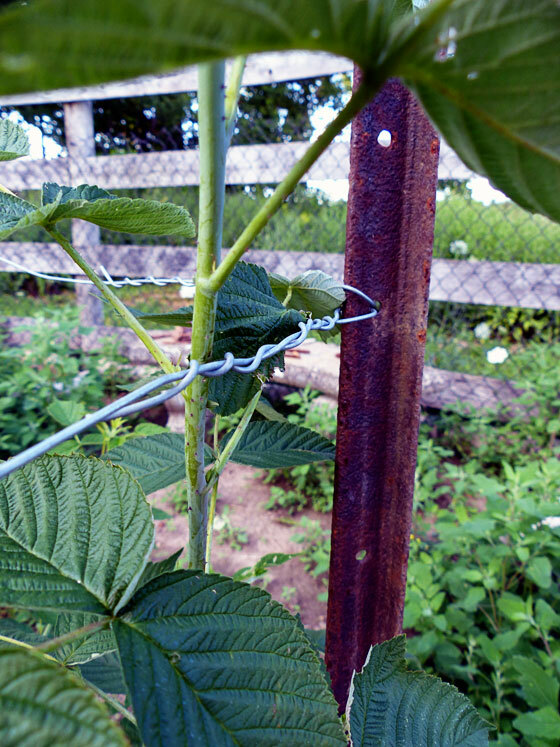 The raspberries grow between the wires staying nice and straight. About once a week, I walk along the row and make sure all of the growing canes are tucked inside the wires. 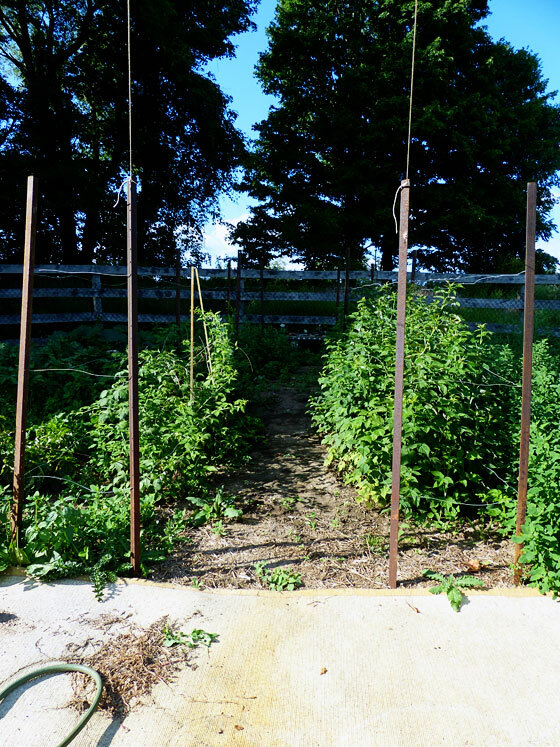 Any canes that sprout outside the row can be transplanted to inside the boundaries. So far, we’ve had just a handful of berries, as we only started our canes last year. Our plants, though, have become thick and lush. With our trellis in place, we’re set to have a great crop of raspberries next year. Have you picked any raspberries this year? Do you grow raspberries? Have you ever built a raspberry trellis? Very nice! It’s great that you had the supplies on hand too. I love it when that happens. We have wild black raspberries, but for two years now, we have had blooms, but no berries. I’m not sure why. We had them the first year we moved into BHH. That would be frustrating to see the blooms but then to not get any berries. We have some wild black ones too. I actually transplanted some into the garden. I’m not sure if they’re going to last in there, especially when they grow wild everywhere on the farm. I think I might try somethin more domesticated instead. We need to do this too. 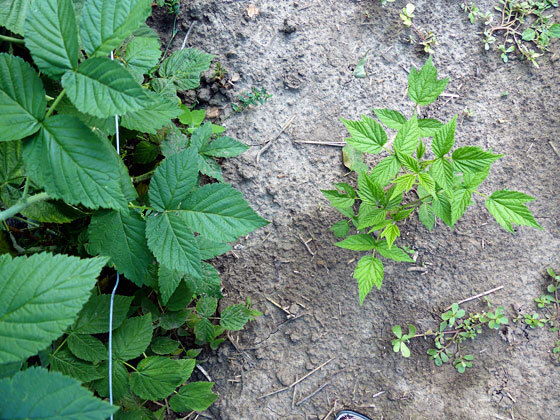 We received some raspberry canes as a gift last year from a student, and they are thriving! Unfortunately not where they need to eventually go, which is the future veggie garden. We need to clear some space this summer and get them moved so that eventually they will get berries. That was great to be able to use the posts you already had. Bonus! Glad to hear your berries are thriving. In my experience they transplant pretty well, so hopefully they continue to thrive once you move them to their new home. Thornless! That would be wonderful. I’m wondering about replacing some of the wild black raspberries that I transplanted into the garden with a more domesticated blackberry. I’m glad to hear thornless versions exist. The thorns on the blacks are ridiculous!